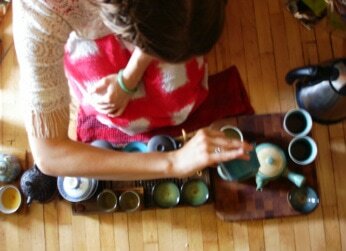 Offering customized tea services and ritual. And rare teas for sale. Contact travelingshrine@gmail.com for information and inquiries. Tea combines the all sensual, earthly, sacred, social, philosophical, and artistic elements of this world. It is where culture meets nature gently, as in an offering to dance. It is part ritual, part impossible moment--"one meeting, one chance." I am a chaiwala because the tea experience is a way of sharing in a great reverence--for nature, for pleasure, for the present moment, for each other-- a reverence that the busy world often forgets. Check out my tea notes on Steepster and my writing for the Dobra Tea newsletter (and, of course, my blog)! My tea events feature tastings, classes, teas attuned to the seasons and Astrological influences, ceremonies, or whatever tea needs you require, as well as over 12 years of experience in all things tea.